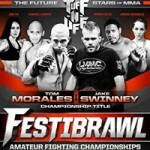 Leading amateur promotion Tuff-N-Uff crowned two new female champions tonight at “Festibrawl 3” in Las Vegas, Nevada. In the night’s co-main event, Jordan McDonald took a clear-cut Unanimous Decision victory over Texas native Jinh Yu to become Tuff-N-Uff 110-pound women’s champion. Competing for the second time in two weeks, Cortney “Cast Iron” Casey earned another impressive win under the Tuff-N-Uff banner tonight. Casey submitted Rachael “The Panther” Cummins with a second-round armbar to capture the 125-pound women’s title. She has now won four straight fights. McDonald (5-3-0) opened the fight with kicks to the lead leg and body of Yu (3-2-0), who responded with a nice left cross. McDonald clinched and held Yu against the cage for the remainder of the round. She attempted a guillotine choke and defended against Yu’s takedown attempts. It was more of the same in rounds two and three as the fighters continued to battle in the clinch for prolonged stretches. McDonald landed knees in the second stanza, but Yu countered by taking her back and dragging her to the mat. McDonald stayed calm and spun into Yu’s guard before the fighters were stood up. In the final round, Yu flurried with punches, but McDonald remained effective with knees to the body and she was dominant in the clinch. After three rounds, the judges were united in their verdict and all three scored the fight for McDonald, who captures her first Tuff-N-Uff title. Winner: Jordan McDonald by Unanimous Decision after three 3:00 rounds. She improves to 5-3-0 and becomes the new Tuff-N-Uff 110-pound women’s champion. Earlier in the night, Casey (5-1-0) posted her second straight win for Tuff-N-Uff with a slick submission of 125-pound tournament champion Cummins (2-3-0). Taking advantage of a scramble on the ground, Casey locked on an armbar and Cummins was forced to hastily submit. Casey has not lost since her second career fight in January. Cummins’s two-fight winning streak came to an end with the loss. Winner: Cortney Casey by Submission (Armbar) at 2:02 of round two. She improves to 5-1-0 and becomes the new Tuff-N-Uff 125-pound women’s champion.